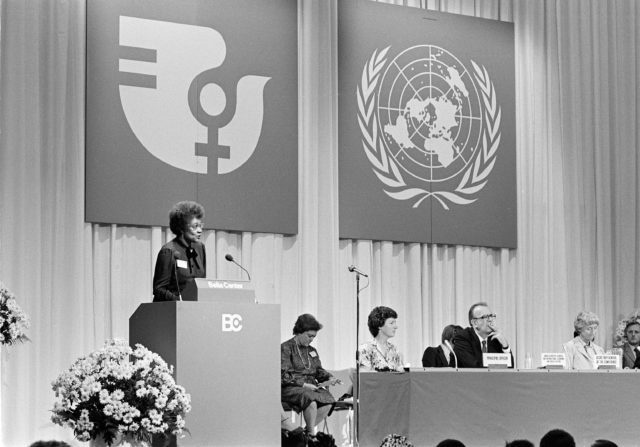 The second UN world conference on women, called the World Conference of the United Nations Decade for Women (or the mid-decade conference) brought together 145 UN Member States in Copenhagen between July 14 and 30, 1980. This conference reviewed progress made on attaining the goals of the first UN world conference on women in 1975, focused especially on employment, health, and education. A Programme of Action for the Second Half of the United Nations Decade for Women elaborated on stronger national measures to improve women’s control of property, rights to inheritance, child custody, and nationality, among other things. Significant disagreements emerged during this conference over what can be considered a “women’s issue” that cut largely along North-South lines. Other political divisions were also salient, as women sought to discern how feminism should address global divisions around issues like socialism versus capitalism and around the Israeli-Palestinian conflict. Such political divisions were also visible at the parallel NGO Forum attended by over 10,000 people, where debates were often intense. As the Forum did not need to agree on a single document, these debates and divisions did not jeopardize the formal process. In fact, it was an important learning experience that prepared the groundwork for greater understanding of the enormous diversity of women both in their perspectives and their needs.